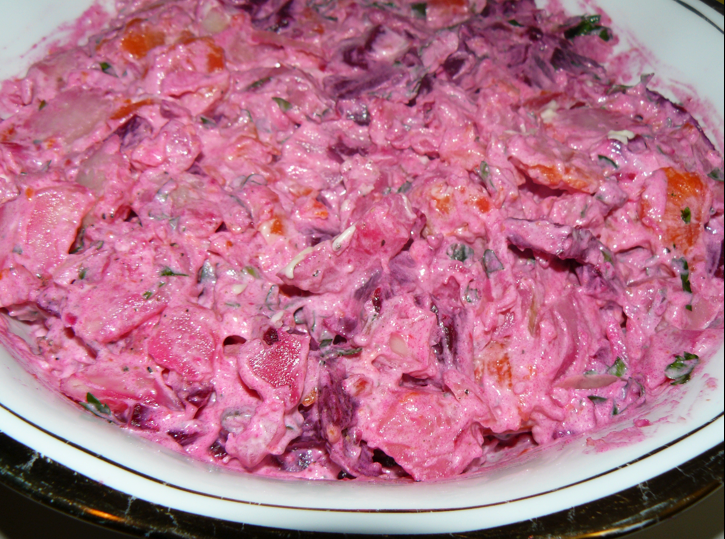 This beet and potato salad is a popular dish to make at special occasions and party events. Put the carrots and potatoes to boil and add ½ tsp of salt to water. Cut the beet stems about 1 inch from the top to preserve its color. In a separate pot, add water and ½ tsp of salt. Boil the beets for approximately one hour or until tender. In a mixing bowl, peel and chop the carrots and potatoes into half inch chunks. Peel and dice the beets then add to the mixing bowl. Drizzle melted butter over the salad. Combine fresh parsley, ground pepper, mayonnaise and stir. My mom and sis love to make this and I wanted to eat it but I didn’t know how. I went to a farm and I hand pick beet and I was able to make this. I made this for the first time and it was delicious my hubby love it. Thanks for the wonderful recipes.